The number of extreme weather events is rising alarmingly across the world—increase in heat wave frequency and the number of warm days and nights across Europe, hurricanes in the US and Caribbeans, floods in Brazil and Uganda, flash floods in Nairobi, Kenya, rising sea level in tropical small island developing states, cyclone Pam in Vanuatu, droughts in West Africa, droughts and wildfires in the US, and droughts, floods and heat waves in India and Pakistan are just some examples. Less discernible yet equally well recorded are the gradual impacts of climate change. Australia recorded its hottest summer ever and the warmest June and August were recorded in many parts of the world. Several events witnessed a departure from what would normally be expected. Globally, 2015 is on course to becoming the hottest ever recorded. The combined average temperature over global land and ocean surfaces for September 2015 was the highest for September in the 136-year period for which the record has been kept, at 0.90°C (1.62°F) above the 20th century average of 15.0°C (59.0°F), surpassing the previous record set in 2014 by 0.12°C (0.19°F). This increase has resulted in daily temperature extremes and heat waves across the world. Observations since 1950 show changes in some extreme events, particularly daily temperature extremes, and heat waves. It is likely that the frequency of heavy precipitation will increase in the 21st century in many regions. It is almost certain that increases in the frequency of warm daily temperature extremes and decreases in cold extremes will occur throughout the 21st century on a global scale. It is almost certain that heat waves will increase in length, frequency and intensity over most land areas. It is likely that the average maximum wind speed of tropical cyclones (also known as typhoons or hurricanes) will increase throughout the coming century, although possibly not in every ocean basin. However it is also likely—a 66 per cent to 100 per cent probability—that overall there will be either a decrease or essentially no change in the number of tropical cyclones. There is evidence that droughts will intensify over the coming century in southern Europe and the Mediterranean region, central Europe, central North America, Central America and Mexico, northeast Brazil, and southern Africa. But there is also some hope that things might not turn out to be as bad as they sound because of definitional issues regarding how to classify and measure a drought, a lack of observational data, and the inability of models to include all the factors that influence droughts. It is very likely that average sea level rise will contribute to upward trends in extreme sea levels in extreme coastal high water levels. Projected precipitation and temperature changes imply changes in floods, although, overall, there is low confidence at the global scale regarding climate-driven changes in the magnitude or frequency of river-related flooding due to limited evidence and because the causes of regional changes are complex. We have used EM-DAT, The International Disaster Database of Centre for Research on the Epidemiology of Disasters (CRED), for this analysis. EM-DAT maintains one of the most credible global databases on disaster reports. This contains essential core data on the occurrence and effects of over 18,000 mass disasters in the world from 1900 to present. The database is compiled from various sources, including UN agencies, non-governmental organisations, insurance companies, research institutes and press agencies. 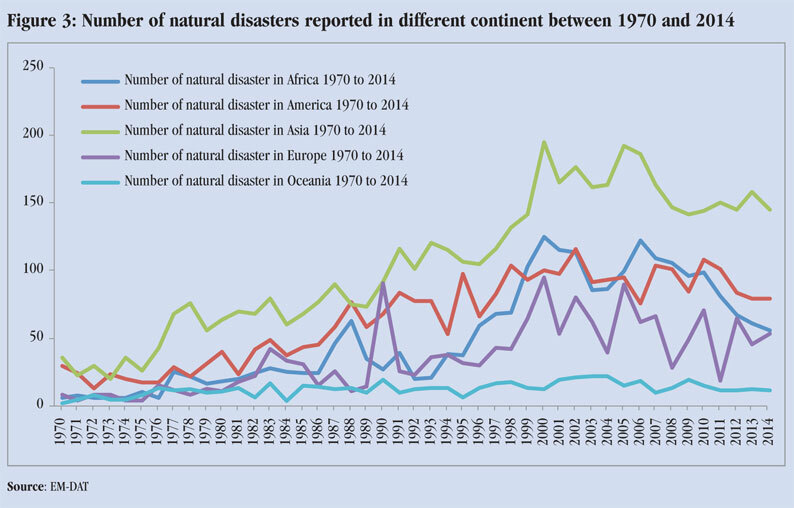 Total number of globally reported natural disasters (flood, storm, drought and other types) between 1970 and 2014 are shown below. 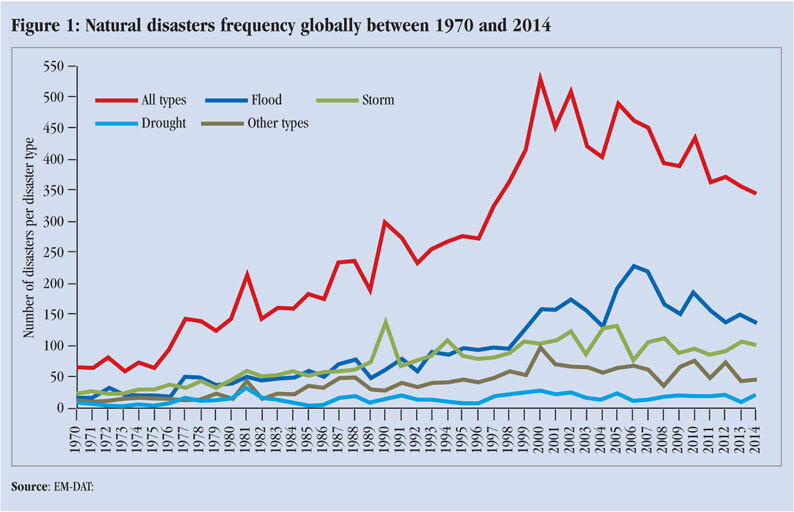 Globally, all types of natural disasters, whether floods, storms or droughts, have increased in frequency from an average of 50-plus events during 1970s to 350 events in 2014, even touching the 500-plus mark in 2000. The number of floods increased from less than 50 in 1970 to 226 in 2006 and 218 in 2007. The number of storms increased from less than 50 in 1970s to more than 120 in 1990 and 2005. Between 2000 and 2010, it remained above 50 every year. Drought frequencies, but not intensity or spread area, have also increased, crossing the mark of 20 in 1981 and 2000s. 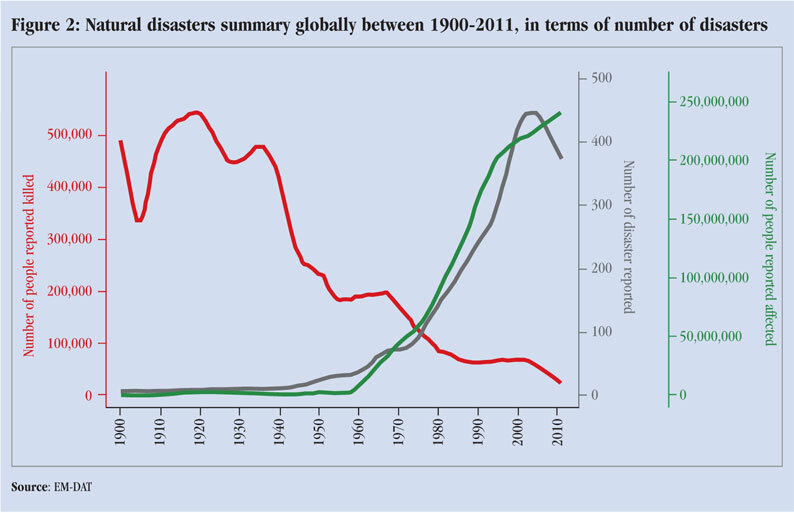 Analysis of global natural disasters has been done on the basis of reported number of deaths, financial loss and number of events by EM-DAT, as shown in Figure 2. This analysis shows that financial loss increased during this period. However, the number of reported deaths greatly decreased. For every year since 1970, the number of disasters in Asia was greater than in any other continent. Number of disasters has been increasing in every continent. Between 2000 and 2014, Europe faced lesser number of disasters as compared to Asia, Africa and American continents. The majority of disasters in Africa are hydrometeorological in nature, with droughts still affecting the largest number of people on the continent and floods occurring frequently along the major river systems and in many urban areas. Cyclones mainly affect Madagascar, Mozambique and some of the Indian Ocean islands. 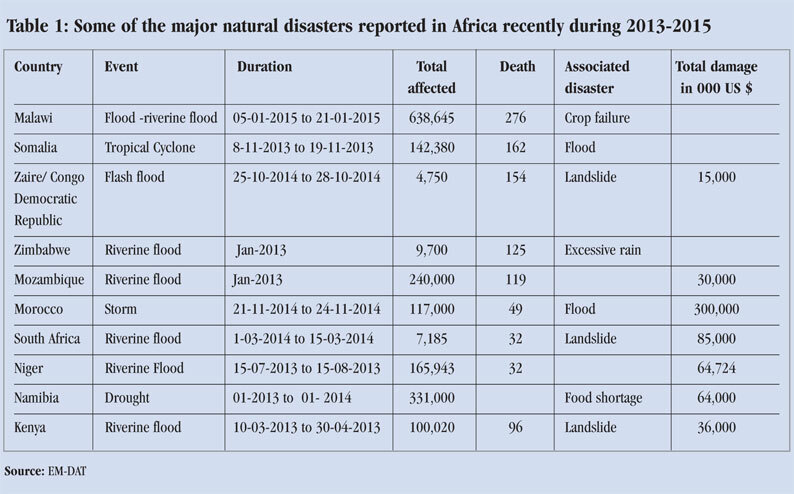 Table 1 lists some major disasters that took place in Africa between 2013 and 2015. 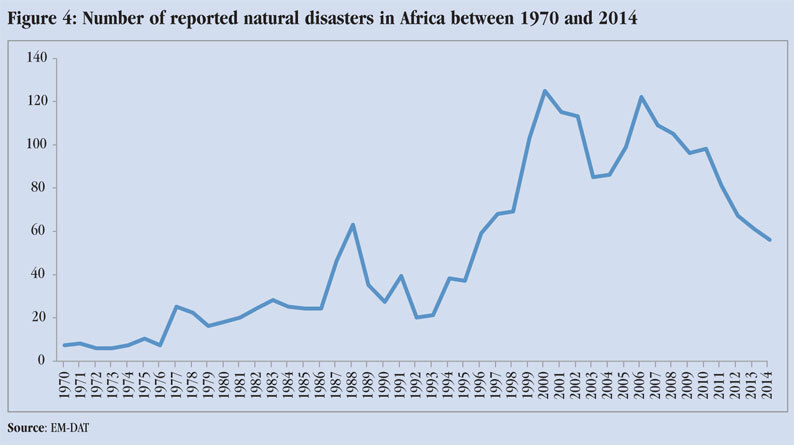 Figure 4 shows that the number of disasters reported in Africa has increased significantly, especially since 1970s. Between 1950 and 1964, disaster frequency remained below 10. It crossed 60 in 1988 and 120 in 2000 and 2006. Between 2006 and 2012, the number of disasters decreased a little but still remained above 60 a year. 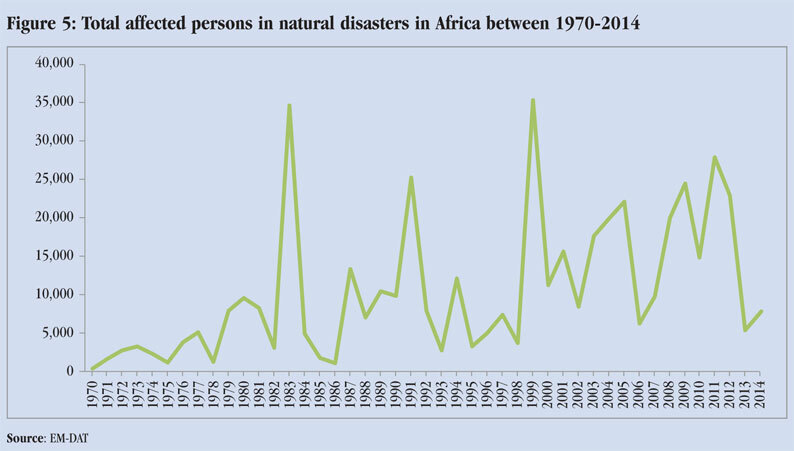 There was an increase in the number of affected people in Africa between 1970 and 2014, as shown in Figure 5. There have been some peaks in 1980 and 1999, where the number of affected persons touched the figure of 34 million and 35 million respectively. India and the surrounding areas have witnessed many extreme weather events in the recent past. Floods in Gujarat spread into the Gir wildlife sanctuary killing at least 10 lions, 1,670 Nilgai and other wild animals in the region. Flash floods in Jammu and Kashmir caused massive destruction in 2014 and June 2015. 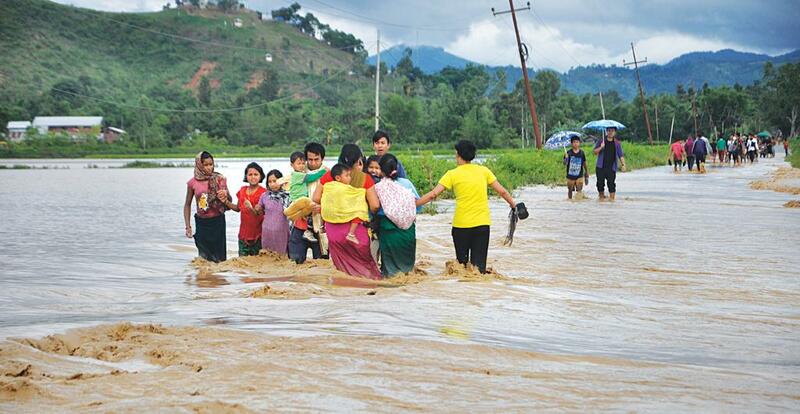 Assam and other north-eastern states were ravaged by flood with more than 550 villages affected in Assam in June this year. While unseasonal rainfall and hailstorm in February–March this year destroyed crops in 15 states of the country, creating havoc for farmers, reportedly resulting in the death of approximately 1,153 farmers in Uttar Pradesh alone, 601 farmers in Maharashtra and various farmers in other states of country. Some farmers died due to shock due to crop loss; others committed suicides. This was followed by deadly heat waves which engulfed most of the northern states and caused a death toll of more than 2,100 in the southern states of Andhra Pradesh, Telangana, Odisha and West Bengal in April and June. EM-DAT database depicts India as one of the most disaster-prone countries of the world. At present, India is facing a monsoon deficit of 14 per cent. A total of 302 districts across India, nearly half of its districts, received deficit or scanty rainfall this year, according to India Meteorological Department. As of October, 2015, various states of the country including Maharashtra, Madhya Pradesh, Karnataka, Odisha and Andhra Pradesh have been declared drought-hit by the state governments. Other states including Uttar Pradesh, Bihar, Gujarat, Telangana, Jharkhand, Rajasthan and Haryana might soon be declared drought-hit as they account for 149 of the 302 rainfall deficit districts of the country. There is no reliable comprehensive disaggregated database on disasters in India. Many disaster events in India go unreported. Small-scale disasters (where casualties are less than 10) constitute an overwhelming majority of disaster events in India but are not captured by the international database maintained by EM-DAT. Despite these lacunae, India ranks third, after USA and China, in number of disasters events and fifth in terms of economic damages which shows the extreme vulnerability of the country to disasters. 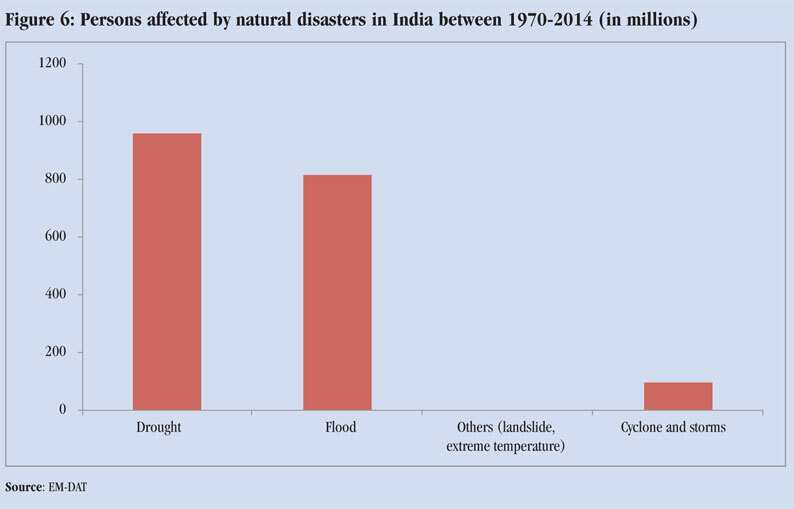 Figure 6 gives a fair idea about the number of persons affected by various climate-related disasters occurring in India during 1970-2014. Maximum number of people were affected by drought (961 million). It can be seen from the graph that the number of people affected by flood during 1970-2014 went up to 814 million. 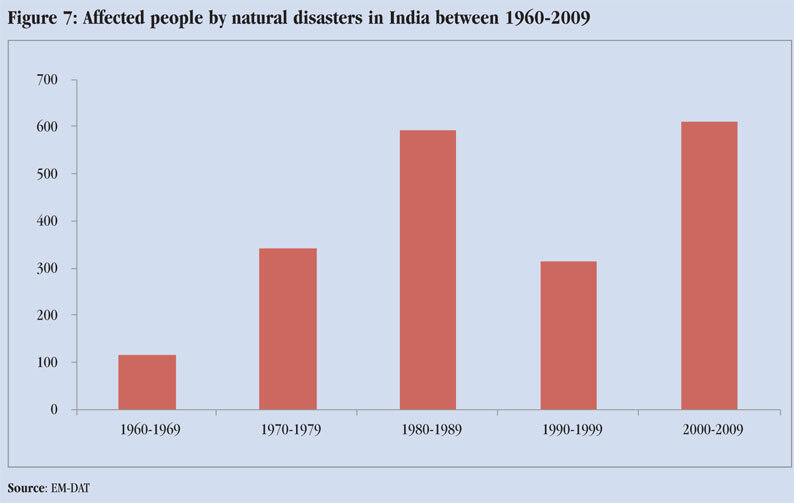 Figure 7 shows the total number of affected people by natural disasters in India in different decades. Total number of affected people has increased substantially from 1960–69 to 2000–09. A study by the National Institute of Disaster Management, India, (for the period 1974–2003) shows that India ranks ninth (7,413.5) in mean annual number of victims (people killed and affected) per hundred thousand inhabitants. The only countries which rank higher than India are Botswana (13,528.6), Djibouti (12,942.7), Bangladesh (12,388.5), Mauritania (11,853.5), Zimbabwe (8,192.1), Malawi (8,747.6), Antigua and Barbuda (8,248.6) and Mozambique (7,665.5), which are far below India in other indices of development. Figure 8 clearly reflects how the fund allocation has been increasing considerably over the years in India. 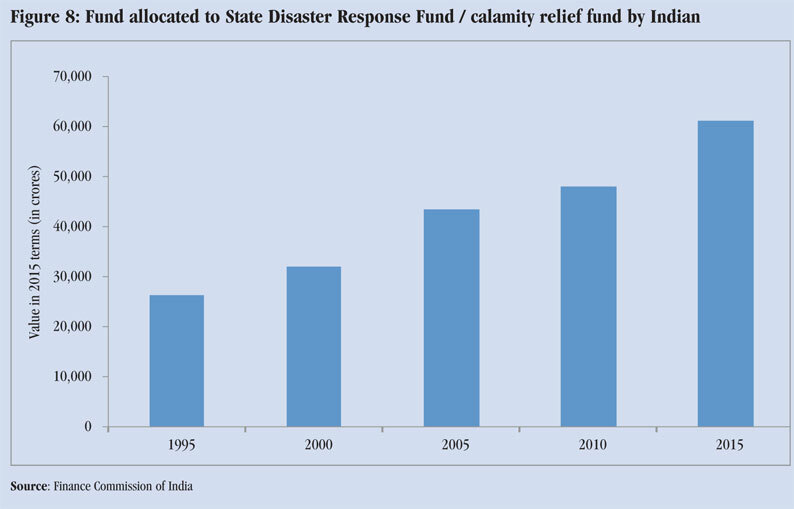 The decision to increase the size of state disaster response fund has been taken by the government of India, acknowledging that there has been “rising intensity and frequency of disasters” in India. The 10th Finance commission (1995–2000) had allocated Rs 63,042.7 million (value in 1995 terms) for SDRF, which subsequently increased to Rs 612,190.0 million (value in 2015 terms) in 14th Finance commission (2015–20) for this purpose. When we use truncated data series of a data series with clear cut cyclic variation will give you poor quality inferences. For example, All-India SWM precipitation presents a 60-year cycle. The above the average 30 year period started in 1987 and end by 2016. In this period you get more floods and less droughts. In the previous 30 yar below the average period, give more drought years and less flood years. In the case of Andhra Pradesh [undivided] with two monsoons, the annual march of precipitation gives a 132 year cycle. The SWM & NEM, precipitation, separately give 56 year cycle but follow an opposite pattern and still fllow the 132 year cycle in annual rainfall. The current below the average 66 year part started in 2001. That means, before 2001, it is above the average 66 year period in which 24 years are flood years and 12 years are drought years. TheKrishna Rver water availability follow the 132 year cycle.